Heart-rate recovery (HRR) can be defined as the rate at which heart rate declines after the cessation of physical exercise . 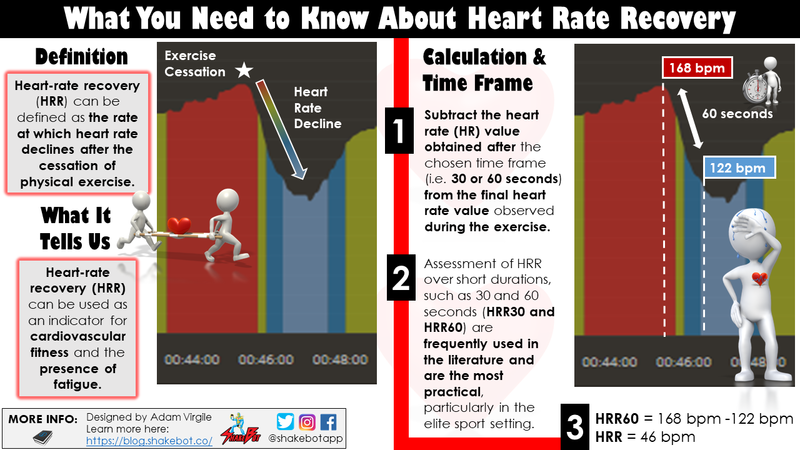 HRR can be calculated over different time frames, classically between 30 seconds and 3 minutes post-exercise, by subtracting the heart rate (HR) value obtained after the chosen time frame from the final HR value observed during the exercise [2-5]. Assessments of HRR over shorter durations (i.e. 30 seconds, 1 minute) are frequently used in the literature and are the most practical, particularly in the elite sport setting. Since there appears to be increased reliability of HRR measurements when assessed over shorter durations , and the outcome of a systematic review by Daanen et al. (2012) suggests that the measurement of HRR should occur within one minute to better detect meaningful differences over time, HRR assessment over the 30-60 seconds following exercise is recommended . Therefore, most of this article will focus on shorter-duration HRR assessment, its indications, and applicability for assessing fitness and fatigue. Heart-rate recovery (HRR) is defined as the rate at which heart rate declines after the cessation of physical exercise. What Can Heart Rate Recovery Signify? I’ve observed that many people find the concept of heart rate recovery (HRR) to be confusing, so I’ll begin with a brief explanation of HRR and what it may indicate. A high or elevated HRR typically indicates a high or elevated level of cardiovascular fitness. However, just because a high or elevated fitness level exists, does not mean that its presence will be readily apparent; this is because fatigue can mask the display of fitness. You could be in peak cardiovascular shape but, if you’re also fatigued from the high stress of previous training, you will not be able to demonstrate your robust level of fitness. This is important to understand when considering a potential relationship between performance outcomes and HRR. While HRR indicates a high or elevated level of fitness, performance may actually be reduced at this time due to the presence of fatigue, or overreaching. Also, one should not expect a change in HRR to indicate improvement in power or strength-related parameters. Significantly higher rates of post-exercise heart rate recovery (HRR) are observed in the population of athletes, compared with the general population [7-11]. The recovery of the heart rate is, initially (during the first minute of the recovery), predominantly conditioned by the activation of the parasympathetic part of the autonomic nervous system . Since the cohort of elite athletes typically has higher parasympathetic tone, we expect to observe faster heart rate recovery in this population, compared with the general population . Another indicator of parasympethic activity in the autonomic nervous system is heart rate variability (HRV); HRV is beyond the scope of this article andyou can learn more about HRV here. Increases in training status have coincided with increased heart rate recovery (HRR), in both the general population , and in athletes [14-16]. Furthermore, fitter and more elite-level athletes have faster HRR rates, compared with their less fit and less-elite counterparts [17-21]. This notion holds true in the general population, as well; individuals with higher levels of fitness, as determined by VO2max, have faster rates of heart rate recovery, compared with those with lower levels of cardiovascular fitness [22-24], independent of gender . Buchheit et al. (2012) observed coinciding increased HRR rates and enhanced fitness (via improved repeated sprint performance), in trained soccer players . However, there was no association between HRR and improvements in maximal running velocity during an incremental running test, countermovement jump performance, or acceleration and maximal sprinting speed obtained during a 40-m sprint . As alluded to previously, the lack of relationship here is expected, since these assessments primarily elucidate outcomes relating to power and strength. In a previous study using young handball and basketball athletes, Buchheit (2008) found a meaningful relationship between performance during an intermittent running test and HRR metrics . Rodríguez-Fernández et al. (2017) also observed a relationship between HRR during a sport-specific fitness test inclusive of repeated and progressive maximal efforts, and repeated sprint performance . Watson et al. (2017) recently found a relationship between HRR 30 seconds post-exercise and VO2max in 84 collegiate intermittent sport athletes . In line with previous research , there was no difference between sexes . The aforementioned findings appear promising, but it’s important to note that the research in athletes is limited, and the methodologies used to collect the HRR data are heterogeneous (i.e. diverse). For example, let’s investigate subject positioning. Although there are a few other intriguing studies assessing relationships between fitness and HRR in athletes, the HRR measurements were obtained during a post-exercise active recovery period, rather than passively [25, 26]. It’s well-known that the positioning of the athlete during HRR data collection, particularly during active movement, can substantially impact the results, which makes the outcomes from these studies difficult to interpret alongside the studies assessing HRR during passive recovery [26-29]. The impact of athlete positioning during HRR data collection is illuminated by recent work of Michaelson et al. (2019). In their study with collegiate female soccer players performing high-intensity interval training, there were substantial differences in HRR rates when the athletes recovered with their hands on head, compared with hands on knees . Recovering with hands on the knees resulted in a significantly faster HRR (by 22 beats per minute, on average), compared with hands on head . Therefore, if heart rate recovery (HRR) is to be assessed, what the athlete is doing during HRR data collection, as well as how the athlete is positioned during that time, must be considered. I can appreciate that it may be difficult to control for these variables, particularly in team sport contexts. Collaboration with the athletes and coaches may vastly improve protocol standardization and the potential for valid and reliable HRR data collection. The intensity of the exercise may affect the heart rate recovery (HRR) response. Mann et al. (2014) investigated heart rate recovery rates in response to different exercise intensities in middle-aged runners. Heart rate recovery (HRR) assessed 60 seconds following exercise was more rapid after exercise at higher intensities, but only up to a certain point, after which recovery rates leveled off. A significant increase in HRR between 60 and 70 % VO2max trials was observed, with no further increase between 70 and 80% VO2max . When experimenting with different step test protocols, Huchu (2016) found increasing HRR rates with step tests which elicited higher maximum heart rate values . HRR was substantially faster following achievement of 80% HRMax, compared with 70% HRMax . Although not statistically analyzed, Al Haddad et al. (2011) observed variable HRR rates between sub-maximal and supra-maximal exercise . Higher reliability of HRR values was observed with higher exercise intensity , which is in agreement with Lamberts et al. (2004), . Overall, it appears that higher-intensity exercise induces faster HRR and higher reliability of HRR values [6, 31-34]. In addition to the intensity of exercise, consideration must be given to the type and duration of exercise. For example, do Nascimento Salvador et al. (2016) found that heart rate recovery (HRR), measured 60 seconds post-exercise, was greatest following a single bout of continuous exercise, compared with both (1) two successive bouts of continuous exercise, and (2) a continuous bout of exercise preceded by repeated sprints, in amateur male futsol players . Furthermore, two successive bouts of continuous exercise resulted in a faster HRR, compared with a continuous bout of exercise preceded by repeated sprints . In a study involving 22 international soccer players participating in UEFA Champion’s League, Dellal et al. (2015) observed similar HRmax values from a continuous test (Vameval) and an intermittent test (Yo-Yo IE2). However, HRR rates measured 1-minute post-testing were faster following the intermittent test (Yo-Yo IE2), compared with the continuous test . It may be relevant to consider the duration and type of exercise that was performed when assessing post-exercise HRR results. Additionally, the type and duration of the acute exercise that preceded the exercise for HRR collection (if any) should be appreciated. A pragmatic way to control for these variables in the team sport setting is to collaborate with the coaching staff to structure a consistent and repeatable sequence of practice drills that can be prescribed on an incremental basis. This will allow for longitudinal HRR assessment using a standardized exercise type, duration, and acute preceding exercise. The environment, including the exercise-specific situation and temperature, also warrant consideration when evaluating HRR. In their study, Dellal et al. (2015) observed that the number of players and the presence of the goalkeepers during small sided games can alter the exercise intensity, which affects subsequent HRR . Furthermore, the presence of a ball  and coach encouragement , as well as tactical and technical game-play environments, can impact the HR response [39-41]. Reviewing all of the factors that can affect heart rate (HR) response is beyond the scope of this article; I am bringing up a few things that impact the HR response because it’s important to understand factors that can influence the intensity and duration of exercise, which impacts HRR. We will re-focus, now, to HRR. Kilgour et al. (1994) found HRR rates to be slower in high ambient temperature than in moderate conditions, likely due to increased vasodilation and consequential increase in heart rate (HR) caused by heat . This notion is supported by Coker et al. (2018), who showed that NCAA Division I male soccer players spent more time >85% HRMax during matches throughout the course of a season when playing in hot and humid environments, compared with less humid and cooler environments . The reduced rate of HRR in the presence of heat stress has been reported elsewhere, as well [44, 45]. Various sport-specific factors can influence heart rate response, which ultimately influences HRR. Some of these factors include the presence of goalkeepers, presence of a ball, level of coach encouragement, and technical and tactical gameplay environments (size of the allotted space, defender placement, etc.). Reduced HRR is observed in hot and humid environments, likely due to the coinciding increased vasodilation and heart rate. It has been suggested that changes in heart rate recovery can indicate an imbalance between appropriate training stress and adequate recovery . Historically, faster heart rate recovery following near-maximal exercise bouts has been associated with functional overreaching, which is a state of short-term performance reduction due to a combination of increased training and/or inadequate recovery [51-53]. For example, Thomson et al. (2016) observed increased HRR 60 seconds (by ~6 bpm) following a 5-minute maximal cycling time trial after a 2-week heavy training period, in 11 well-trained male cyclists and triathletes . After a subsequent 2 days of rest, the HRR 60 seconds following the cycling time trial decreased back to where it was during light training . Recently, Le Meur et al. (2017) found that maximal, or near-maximal, intensity exercise may not be required for HRR to be indicative of functional overreaching . Following a 3-week period of heavy training, HRR 60 seconds after cessation of exercise across a wide range of exercise intensities (~60% to 100% of maximal aerobic speed) were all indicative of functional overreaching, in 20 trained triathletes . It’s important to note that a reduced HRMax should also be expected when in a fatigued state, as observed in the two aforementioned studies [50, 53], as well as in others [54-57]. In any case, increases in HRR in concert with decreases in HRMax may indicate functional overreaching, or a state of fatigue with coinciding performance decrement. Harry and Booysen (2019) recently examined relationships between in-game demands, heart rate recovery, and performance on physical tests, such as repeated sprint ability (RSA) and repeated high-intensity aerobic capabilities (via a submaximal YoYo IR1 test), in 32 elite female field hockey players . Players with a faster heart rate recovery (HRR) at 10s and 60s during the submaximal YoYo IR1 test also spent a greater percentage of their playing time at running and sprinting speeds during matches. This is a concrete example of how incorporating HRR indices into player evaluation and monitoring can provide a coach or practitioner with a reasonably accurate indication of a player’s physical preparedness for competition . Harry and Booysen (2019). Faster Heart Rate Recovery Correlates With High-Intensity Match Activity in Female Field Hockey Players—Training Implications. The Journal of Strength & Conditioning Research. It’s becoming increasingly clear that training load influences heart rate recovery (HRR), and that cardiovascular fitness is associated with increased HRR in a non-fatigued state. HRR is a simple, non-invasive measure that can be used to evaluate both fitness and fatigue qualities and, in my opinion, is a pragmatic approach to assess deviations in both of these qualities in repeated high-intensity sports. For example, in the sport of ice hockey, an athlete is routinely placed in situations that require maximal, or near-maximal cardiovascular exertion, followed by >60 seconds of recovery prior to their next intensive bout, during a practice. Routine quantification of HRR may aid practitioners in evaluating changes in fitness, particularly if they can work with the coaching staff to standardize a drill, or sequence of drills, within a practice structure that repeats itself over the course of a season. In line with the observations of Harry and Booysen (2019), it’s logical to think that athletes who have faster HRR are better prepared to repeat high-intensity efforts with greater frequency, and for longer duration, compared with athletes who are unable to recover from high-intensity exercise as quickly. Monitoring time-course for HRR and how it fluctuates over days, weeks, months, or years, may allow applied sport professionals to better assess athlete readiness for competition, as well as longitudinal changes in cardiovascular fitness and fatigue. Daanen, H.A., Lamberts, R.P., Kallen, V.L., Jin, A. and Van Meeteren, N.L., 2012. A systematic review on heart-rate recovery to monitor changes in training status in athletes. International Journal of Sports Physiology and Performance, 7(3), pp.251-260. Dellal, A., Casamichana, D., Castellano, J., Haddad, M., Moalla, W. and Chamari, K., 2015. Cardiac parasympathetic reactivation in elite soccer players during different types of traditional high-intensity training exercise modes and specific tests: interests and limits. Asian Journal of Sports Medicine, 6(4). Del Rosso, S., Nakamura, F.Y. and Boullosa, D.A., 2017. Heart rate recovery after aerobic and anaerobic tests: is there an influence of anaerobic speed reserve?. Journal of Sports Sciences, 35(9), pp.820-827. Rave, G., Fortrat, J.O., Dawson, B., Carre, F., Dupont, G., Saeidi, A., Boullosa, D. and Zouhal, H., 2018. Heart rate recovery and heart rate variability: use and relevance in European professional soccer. International Journal of Performance Analysis in Sport, 18(1), pp.168-183. Schneider, C., Hanakam, F., Wiewelhove, T., Döweling, A., Kellmann, M., Meyer, T., Pfeiffer, M. and Ferrauti, A., 2018. Heart rate monitoring in team sports—a conceptual framework for contextualizing heart rate measures for training and recovery prescription. Frontiers in Physiology, 9. Lamberts, R.P., Lemmink, K.A., Durandt, J.J. and Lambert, M.I., 2004. Variation in heart rate during submaximal exercise: implications for monitoring training. The Journal of Strength & Conditioning Research, 18(3), pp.641-645. Otsuki, T., Maeda, S., Iemitsu, M., Saito, Y., Tanimura, Y., Sugawara, J., Ajisaka, R. and Miyauchi, T., 2007. Postexercise heart rate recovery accelerates in strength-trained athletes. Medicine and Science in Sports and Exercise, 39(2), pp.365-370. Imai, K., Sato, H., Hori, M., Kusuoka, H., Ozaki, H., Yokoyama, H., Takeda, H., Inoue, M. and Kamada, T., 1994. Vagally mediated heart rate recovery after exercise is accelerated in athletes but blunted in patients with chronic heart failure. Journal of the American College of Cardiology, 24(6), pp.1529-1535. Darr, K.C., Bassett, D.R., Morgan, B.J. and Thomas, D.P., 1988. Effects of age and training status on heart rate recovery after peak exercise. American Journal of Physiology-Heart and Circulatory Physiology, 254(2), pp.H340-H343. Dixon, E.M., Kamath, M.V., McCartney, N. and Fallen, E.L., 1992. Neural regulation of heart rate variability in endurance athletes and sedentary controls. Cardiovascular Research, 26(7), pp.713-719. Du, N., Bai, S., Oguri, K., Kato, Y., Matsumoto, I., Kawase, H. and Matsuoka, T., 2005. Heart rate recovery after exercise and neural regulation of heart rate variability in 30-40 year old female marathon runners. Journal of Sports Science & Medicine, 4(1), p.9. Đurić, B. and Suzić, S., 2016. Heart rate recovery: Short review of methodology. Medicinski Podmladak, 67(2), pp.48-50. Sugawara, J., Murakami, H., Maeda, S., Kuno, S. and Matsuda, M., 2001. Change in post-exercise vagal reactivation with exercise training and detraining in young men. European Journal of Applied Physiology, 85(3-4), pp.259-263. Lamberts, R.P., Swart, J., Noakes, T.D. and Lambert, M.I., 2009. Changes in heart rate recovery after high-intensity training in well-trained cyclists. European Journal of Applied Physiology, 105(5), pp.705-713. Lamberts, R.P., Swart, J., Capostagno, B., Noakes, T.D. and Lambert, M.I., 2010. Heart rate recovery as a guide to monitor fatigue and predict changes in performance parameters. Scandinavian Journal of Medicine & Science in Sports, 20(3), pp.449-457. Buchheit, M., Simpson, M.B., Al Haddad, H., Bourdon, P.C. and Mendez-Villanueva, A., 2012. Monitoring changes in physical performance with heart rate measures in young soccer players. European Journal of Applied Physiology, 112(2), pp.711-723. Buchheit, M., 2008. The 30-15 intermittent fitness test: accuracy for individualizing interval training of young intermittent sport players. The Journal of Strength & Conditioning Research, 22(2), pp.365-374. Rodríguez-Fernández, A., Sanchez-Sanchez, J., Ramirez-Campillo, R., Rodríguez-Marroyo, J.A., Nakamura, F.Y. and Villa-Vicente, J.G., 2017. Relationship between repeated sprint ability, aerobic capacity, intermittent endurance and heart rate recovery in youth soccer players. Journal of Strength and Conditioning Research, 1. Watson, A.M., Brickson, S.L., Prawda, E.R. and Sanfilippo, J.L., 2017. Short-term heart rate recovery is related to aerobic fitness in elite intermittent sport athletes. Journal of Strength and Conditioning Research, 31(4), pp.1055-1061. Cataldo, A., Cerasola, D., Zangla, D., Russo, G., Sahin, F. and Traina, M., 2014. Assessment of autonomic function as marker of training status: the role of heart rate recovery after exercise. European Journal of Sport Studies, 2(1), pp.89-97. Djokic, Z. and Zagatto, A.M., 2019. Ultra-short-term heart rate recovery after maximal exercise in elite European table tennis players. Sport Sciences for Health, pp.1-8. Carnethon, M.R., Jacobs, J.D., Sidney, S., Sternfeld, B., Gidding, S.S., Shoushtari, C. and Liu, K., 2005. A longitudinal study of physical activity and heart rate recovery: CARDIA, 1987-1993. Medicine and Science in Sports and Exercise, 37(4), pp.606-612. Storniolo, J.L., Pavei, G. and Minetti, A.E., 2017. A “Wearable” Test for Maximum Aerobic Power: Real-Time Analysis of a 60-m Sprint Performance and Heart Rate Off-Kinetics. Frontiers in Physiology, 8, p.868. de Mendonca, G.V., Teodósio, C. and Bruno, P.M., 2017. Sexual dimorphism in heart rate recovery from peak exercise. European Journal of Applied Physiology, 117(7), pp.1373-1381. Haraldsdottir, K., Brickson, S., Sanfilippo, J., Dunn, W. and Watson, A., 2018. In‐season changes in heart rate recovery are inversely related to time to exhaustion but not aerobic capacity in rowers. Scandinavian Journal of Medicine & Science in Sports, 28(2), pp.418-424. Suzic Lazic, J., Dekleva, M., Soldatovic, I., Leischik, R., Suzic, S., Radovanovic, D., Djuric, B., Nesic, D., Lazic, M. and Mazic, S., 2017. Heart rate recovery in elite athletes: the impact of age and exercise capacity. Clinical Physiology and Functional Imaging, 37(2), pp.117-123. Buchheit, M., Al Haddad, H., Laursen, P.B. and Ahmaidi, S., 2009. Effect of body posture on postexercise parasympathetic reactivation in men. Experimental Physiology, 94(7), pp.795-804. Boullosa, D.A., Barros, E.S., Del Rosso, S., Nakamura, F.Y. and Leicht, A.S., 2014. Reliability of heart rate measures during walking before and after running maximal efforts. International Journal of Sports Medicine, 35(12), pp.999-1005. Michaelson, J.V., Brilla, L.R., Suprak, D.N., McLaughlin, W.L. and Dahlquist, D.T., 2019. Effects of Two Different Recovery Postures during High-Intensity Interval Training. Translational Journal of the American College of Sports Medicine, 4(4), pp.23-27. Mann, T.N., Webster, C., Lamberts, R.P. and Lambert, M.I., 2014. Effect of exercise intensity on post-exercise oxygen consumption and heart rate recovery. European Journal of Applied Physiology, 114(9), pp.1809-1820. Huchu, L., 2016. The association between cardiorespiratory fitness and performance in a submaximal stepping test standardised for external workload (Doctoral dissertation, University of Cape Town). Al Haddad, H., Laursen, P.B., Chollet, D., Ahmaidi, S. and Buchheit, M., 2011. Reliability of resting and postexercise heart rate measures. International Journal of Sports Medicine, 32(08), pp.598-605. Seiler, S., Haugen, O. and Kuffel, E., 2007. Autonomic recovery after exercise in trained athletes: intensity and duration effects. Medicine & Science in Sports & Exercise, 39(8), pp.1366-1373. Djaoui, L., Haddad, M., Chamari, K. and Dellal, A., 2017. Monitoring training load and fatigue in soccer players with physiological markers. Physiology & Behavior, 181, pp.86-94. do Nascimento Salvador, P.C., de Aguiar, R.A., Teixeira, A.S., de Souza, K.M., de Lucas, R.D., Denadai, B.S. and Guglielmo, L.G.A., 2016. Are the oxygen uptake and heart rate off-kinetics influenced by the intensity of prior exercise?. Respiratory Physiology & Neurobiology, 230, pp.60-67. Dellal, A., Lago-Penas, C., Wong, D.P. and Chamari, K., 2011. Effect of the number of ball contacts within bouts of 4 vs. 4 small-sided soccer games. International Journal of Sports Physiology and Performance, 6(3), pp.322-333. García, O.G., Boubeta, A.R. and Deus, E.R., 2012. Using heart rate to detect high-intensity efforts during professional soccer competition. The Journal of Strength & Conditioning Research, 26(8), pp.2058-2064. Rampinini, E., Impellizzeri, F.M., Castagna, C., Abt, G., Chamari, K., Sassi, A. and Marcora, S.M., 2007. Factors influencing physiological responses to small-sided soccer games. Journal of Sports Sciences, 25(6), pp.659-666. Castellano, J., Casamichana, D. and Dellal, A., 2013. Influence of game format and number of players on heart rate responses and physical demands in small-sided soccer games. The Journal of Strength & Conditioning Research, 27(5), pp.1295-1303. Halouani, J., Chtourou, H., Dellal, A., Chaouachi, A. and Chamari, K., 2017. Soccer small-sided games in young players: rule modification to induce higher physiological responses. Biology of Sport, 34(2), p.163. Sarmento, H., Clemente, F.M., Harper, L.D., Costa, I.T.D., Owen, A. and Figueiredo, A.J., 2018. Small sided games in soccer–a systematic review. International Journal of Performance Analysis in Sport, 18(5), pp.693-749. Kilgour, R.D., Gariépy, P.H.I.L.I.P.P.E. and Rehel, R., 1993. Cardiovascular responses during recovery from exercise and thermal stress. Aviation, Space, and Environmental Medicine, 64(3 Pt 1), pp.224-229. Coker, N.A., Wells, A.J. and Gepner, Y., 2018. The Effect of Heat Stress on Measures of Running Performance and Heart Rate Responses During A Competitive Season in Male Soccer Players. Journal of Strength and Conditioning Research. Peçanha, T., Forjaz, C.L. and Low, D.A., 2017. Passive Heating Attenuates Post-exercise Cardiac Autonomic Recovery in Healthy Young Males. Frontiers in Neuroscience, 11, p.727. Lynn, B.M., Minson, C.T. and Halliwill, J.R., 2009. Fluid replacement and heat stress during exercise alter post‐exercise cardiac haemodynamics in endurance exercise‐trained men. The Journal of Physiology, 587(14), pp.3605-3617. Gambetta, V., 2007. 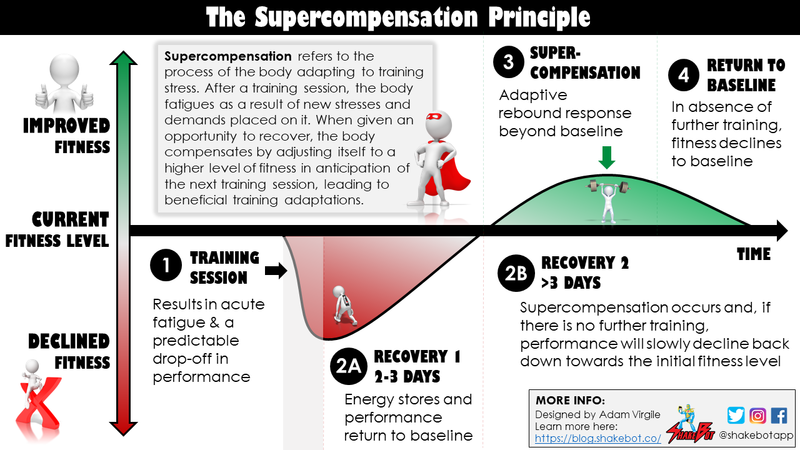 Athletic development: The art & science of functional sports conditioning. Champaign: Human Kinetics. Aubry, A., Hausswirth, C., Louis, J., Coutts, A.J., Buchheit, M. and Le Meur, Y., 2015. The development of functional overreaching is associated with a faster heart rate recovery in endurance athletes. PLoS One, 10(10), p.e0139754. Kreher, J.B., 2016. 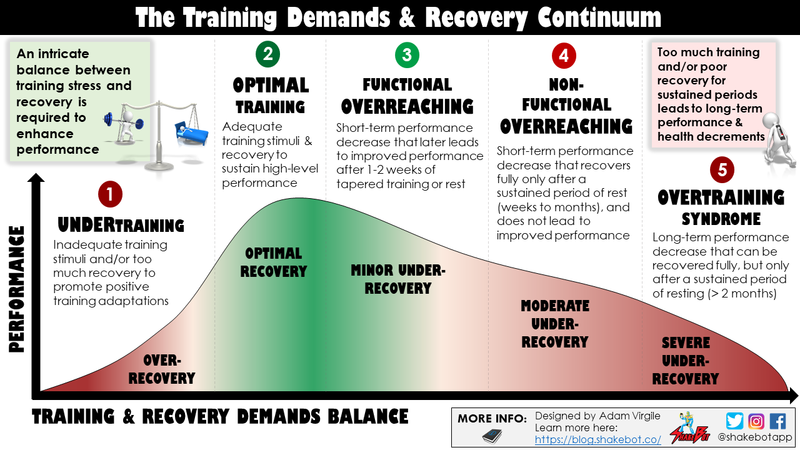 Diagnosis and prevention of overtraining syndrome: an opinion on education strategies. Open Access Journal of Sports Medicine, 7, p.115. Baechle, T.R. and Earle, R.W. eds., 2008. Essentials of strength training and conditioning. Human kinetics. Le Meur, Y., Buchheit, M., Aubry, A., Coutts, A.J. and Hausswirth, C., 2017. Assessing Overreaching With Heart-Rate Recovery: What Is the Minimal Exercise Intensity Required?. International Journal of Sports Physiology and Performance, 12(4), pp.569-573. Lamberts, R.P., Rietjens, G.J., Tijdink, H.H., Noakes, T.D. and Lambert, M.I., 2010. Measuring submaximal performance parameters to monitor fatigue and predict cycling performance: a case study of a world-class cyclo-cross cyclist. European Journal of Applied Physiology, 108(1), pp.183-190. Dupuy, O., Lussier, M., Fraser, S., Bherer, L., Audiffren, M. and Bosquet, L., 2014. Effect of overreaching on cognitive performance and related cardiac autonomic control. Scandinavian Journal of Medicine & Science in Sports, 24(1), pp.234-242. Thomson, R.L., Bellenger, C.R., Howe, P.R., Karavirta, L. and Buckley, J.D., 2016. Improved heart rate recovery despite reduced exercise performance following heavy training: A within-subject analysis. Journal of Science and Medicine in Sport, 19(3), pp.255-259. Coates, A., 2017. Investigating Autonomic Nervous System Regulation and Cardiovascular Function in Response to Overreaching in Endurance Athletes (Doctoral dissertation). Hedelin, R., Kenttä, G., Wiklund, U., Bjerle, P. and Henriksson-Larsén, K., 2000. Short-term overtraining: effects on performance, circulatory responses, and heart rate variability. Medicine and Science in Sports and Exercise, 32(8), pp.1480-1484. Cornforth, D.J., Robinson, D.J., Spence, I. and Jelinek, H.F., 2014. Heart rate recovery in decision support for high performance athlete training schedules. Interdisciplinary Journal of Information, Knowledge and Management, 9, pp.193-208. Harry, K. and Booysen, M.J., 2019. 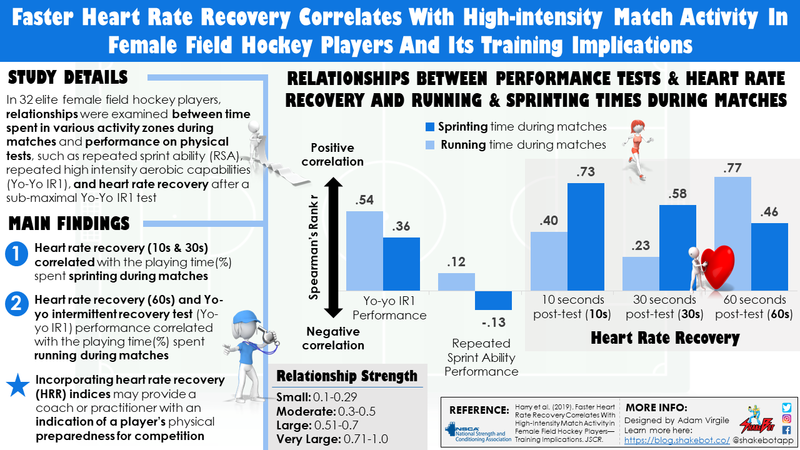 Faster Heart Rate Recovery Correlates With High-Intensity Match Activity in Female Field Hockey Players—Training Implications. The Journal of Strength & Conditioning Research. Next Post Does Training to Failure Maximize Muscle Hypertrophy?